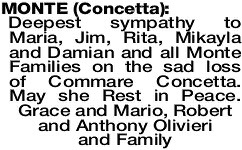 The Funeral Mass for Mrs Concetta Monte formerly of Tuart Hill will be celebrated in St Lawrence's Church, 392 Albert Street Balcatta commencing at 10.15am on WEDNESDAY (17.04.2019). The Cortege will leave the Church at the conclusion of Mass and arrive at the main entrance of KARRAKATTA Cemetery, Railway Road, Karrakatta at 12.00pm for a Burial Service. Vigil Prayers and Rosary will be recited in St Lawrence's Church Balcatta at 7.30pm on TUESDAY evening (16.04.2019). 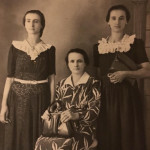 In the B&W photo, there is zia Concetta with two of her five sisters, zia Carmela Monte Russo and zia Paola Monte Galasso. 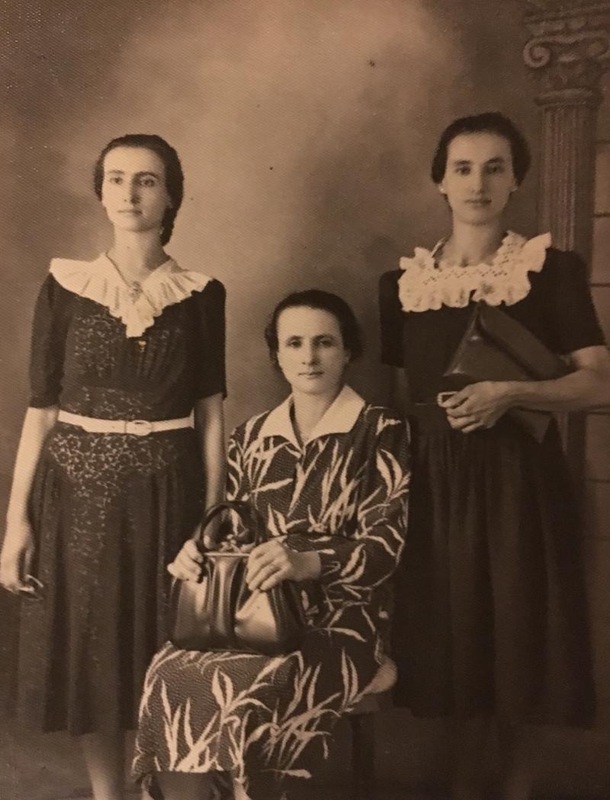 Now they are reunited once again, also with our mamma and nonna Grazia, zia MariaRosa Monte Bartorilla, zio Nino Monte and zia Signorina Monte Varrica. 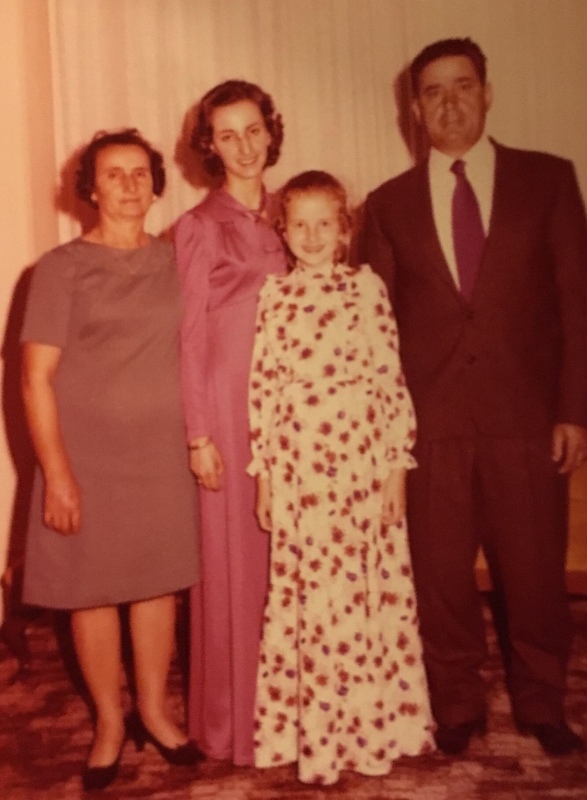 In the other photo, there is her with zio Michele and their daughters Rita and Maria. Condolences to the family. 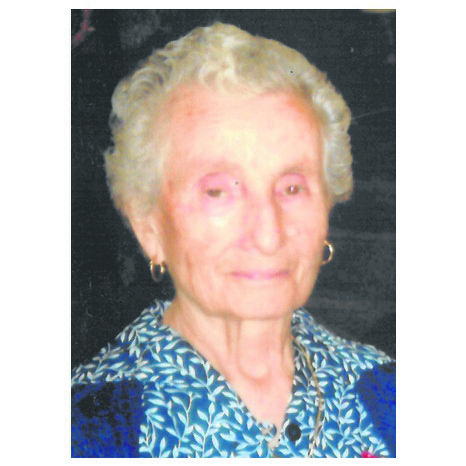 My mother was Maria Catena Monte (Tripolone) and she was born in 1922 in Motta Camastra. 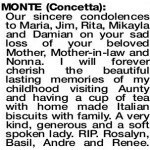 I am sure that my mother used to talk to Concetta on the phone and send her Christmas cards. As mum got older, I used to write her cards for her and so I remember that there was someone in Tuart Hill. May God watch over you all during this very sad time. 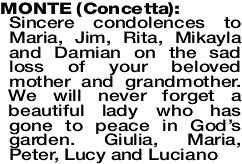 Our heartfelt condolences to our cousins Rita and Maria for the loss of our dear Zia Concetta. Now she is reunited once again with Zio Michele; her parents, Nonno Pietro and Nonna Maria Catena; our Mamma and Nonna Grazia and the other siblings. May they all RIP! Born in Motta Camastra, Sicily 12.08.1925. Passed away on 08.04.2019. Beloved wife of Michael (dec), adored mother to Maria and Rita, mother-in- law to Jim, and loving nonna to Mikayla and Damian. Thank you to all staff past and present at Stirling Aged Care for the continuous care given to Concetta. My beautiful mum, you walked a hard road with your illness but now you are free from all suffering. You have been an inspiration in facing each day with dignity and grace, and you never complained. I was blessed to have you as my mother. Fly away my angel, you are free now, you are united with Dad and will suffer no more. Rest peacefully mum. We will love you today, tomorrow and always. Your loving daughter Maria and son-in-law Jim. To my precious mum, you were the world to me, my mentor, my friend, my mother. You had a caring heart, you were a giver without counting the cost and religious to the very end. I watched you suffer, you never gave up saying the rosary when you could. I will miss the chats, the laughter and your sense of humour. We shared many lovely times, my sweet mum. God closed your eyes and said come and rest, no more suffering. May you rest in God's eternal garden. Remembered with love and never forgotten. To our dear nonna Concetta, thank you for all the beautiful memories, kind words and love over the years. You taught us to always do what is right, to be kind and help others, as you did all your life. 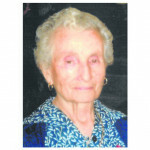 Rest in peace nonna with no more suffering. You will be forever in our hearts. Your grandchildren Mikayla and Damian. 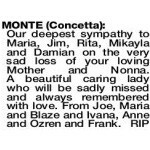 MONTE CONCETTA My sympathy to Maria and Rita and family. I will never forget my Aunty, she for many years would take seed from my cauliflowers for the next plantings. May she rest in peace. 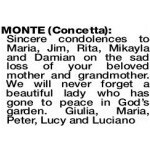 Our heartfelt sympathy to Rita, Maria, Jim, Mikayla and Damian on the sad loss of your beloved Mother, Mother-in-law and Nonna. Our thoughts and prayers are with you during this sad time. Connie and Geoff and family. 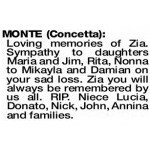 MONTE CONCETTA Dearest Zia Concetta rest peacefully with our Lord. Our deepest condolences to Maria, Rita, Jim, Mikayla and Damian. Love Angela, Franzl and George. Zia, your loving memory will be forever cherished. Now resting peacefully in God's care. 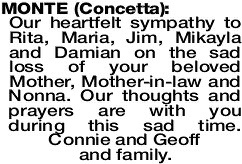 Our heartfelt sympathy to cousins Rita, Maria, Jim, Mikala and Damian at this time of sorrow. Sandra and family. 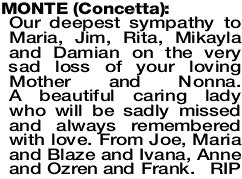 Our sincere condolences to Maria, Jim, Rita, Mikayla and Damian on your sad loss of your beloved Mother, Mother-in-law and Nonna. 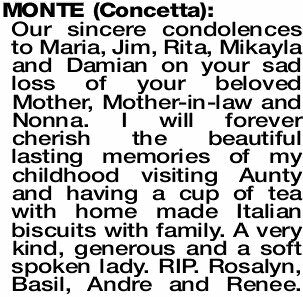 I will forever cherish the beautiful lasting memories of my childhood visiting Aunty and having a cup of tea with home made Italian biscuits with family. A very kind, generous and a soft spoken lady. RIP. Rosalyn, Basil, Andre and Renee. 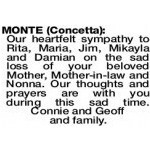 Sincere condolences to my sister-in-law Maria, Jim, Mikayla and Damian and Rita. May your mum rest in peace. Forever in our hearts. Love Jenny, Melissa, Matt and Liana. Loving memories of Zia. 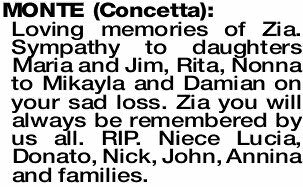 Sympathy to daughters Maria and Jim, Rita, Nonna to Mikayla and Damian on your sad loss. Zia you will always be remembered by us all. RIP. Niece Lucia, Donato, Nick, John, Annina and families. 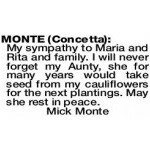 MONTE CONCETTA Our heartfelt sympathy to Maria, Rita and family on your sad loss. Rest in peace. Enna Oliveri and family. 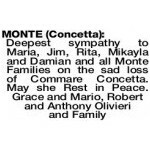 MONTE CONCETTA Deepest sympathy to Maria and family and Rita on your sad loss. 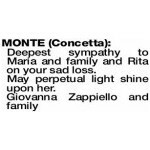 Deepest sympathy to Rita, Maria and family on the loss of your beloved Mother.